Richard starts his analysis of fast growing online beach holiday retailer On The Beach with new SharePad views designed to give him the big picture at a glance. Before I start dreaming about holidays, some humble pie. A few weeks ago I ridiculed the idea of using more than three SharePad windows by suggesting they would be so small, we would need displays the size of a home cinema to see them). My experimentation with SharePad layouts continues thanks to the discovery that my modestly sized laptop screen has a mighty resolution of 3,200×1,800 pixels. That means I can fit an awful lot on it if I am prepared to squint hard enough at the tiny words and numbers. I was not using this dream screen to full effect because it was displaying everything at twice its native size. By bumping the magnification down from 200% to 150%, I can cram five SharePad windows onto it. Now I can fit most of my favourite bits of SharePad into one layout and spacebar my way through a list of shares meeting my base filter criteria, telling at a glance which companies are most likely to interest me. The data does not go back many years, which means On The Beach floated on the stockmarket relatively recently. The bottom right hand panel in the image above (click on it for a full-sized version) is the standard SharePad Summary tab. It tells us On The Beach is a substantial and profitable business. Analysts expect lots more growth, and the company had no debt at the financial year end in September. The shares are not cheap, they cost nearly 23 times earnings on a debt-adjusted basis, but why would they be cheap? At a glance, On the Beach is a very good business. The shares may be worth the high valuation, but only if strong growth continues. I could mention Brexit, and the potential for disruption to the economy and people’s travel plans as reasons to be cautious about that, but I do not need reasons. I think it is risky to rely on strong growth to justify an investment, and rarely pay more than twenty times adjusted profit for a share as a result. Twenty three times is not so far from twenty, though, and one of the biggest favours investors can do for their future selves is get to know good businesses so we are confident enough to buy the shares should the opportunity arise. Back to the Summary tab. Click on the Company tab next to it, and we can confirm On The Beach floated on 22 September 2015. The other charts focus on the company’s profitability and financing over a longer period, a few years longer for On The Beach, and decades for the majority of companies that floated a long time ago. 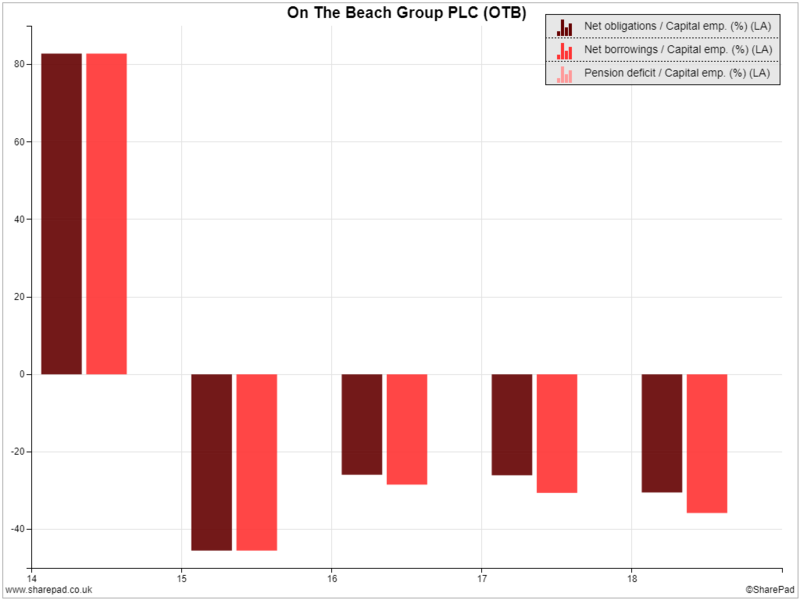 The red chart is a custom chart showing On The Beach’s net financial obligations at the end of each financial year (see this article for how to make the chart and what it shows). For as long as it has been a listed company On The Beach has had far more cash than debt and operating lease obligations. This is very reassuring and somewhat unexpected. Often new issues are laden with debt because the owners have taken cash out of the businesses before floating them. 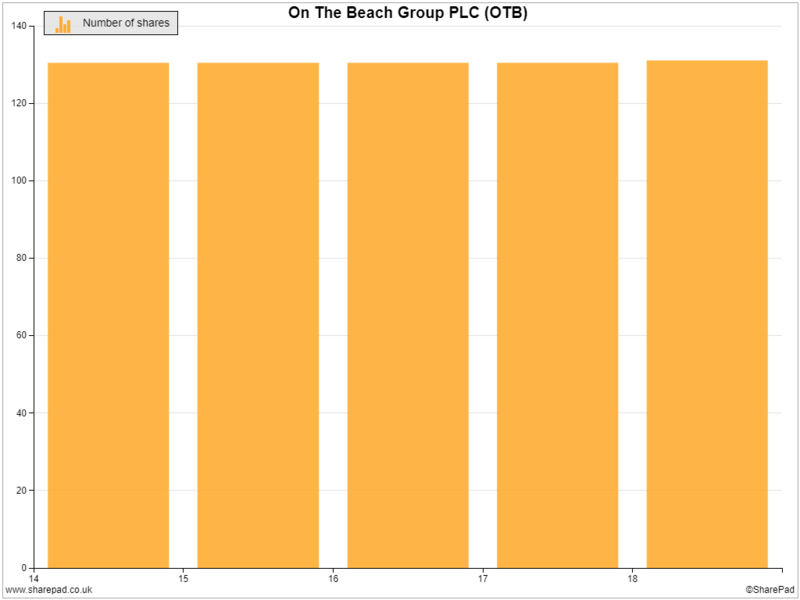 The yellow chart shows the total number of shares in issue at the end of each financial year. It too is reassuring because it shows that On The Beach’s strong financial position has been sustained by cash flows earned from selling holidays, not by raising new capital from shareholders by issuing more shares. On The Beach’s cash return on capital invested is very stable. That does not mean it is earning the same amount of cash each year, it is earning more. Calculations of profitability, ROCE and CROCI, are like the interest rate on a savings account where return is analogous to interest and capital is analogous to the savings generating the interest. 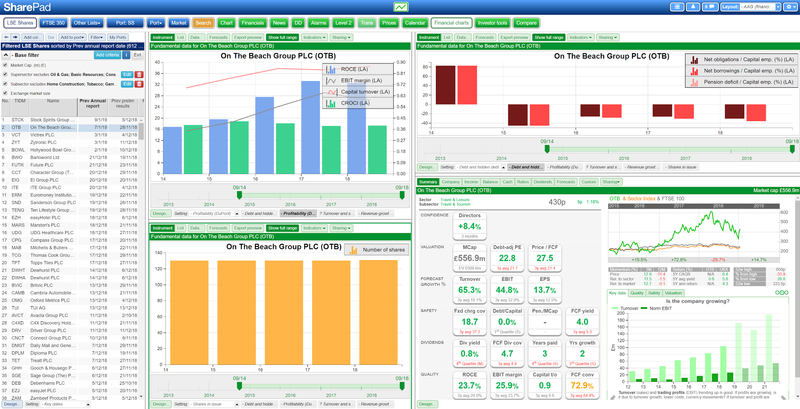 As On The Beach grows, it is using more capital, and it is raking in more cash, almost in equal measure. In fact, On The Beach may be doing better than that. 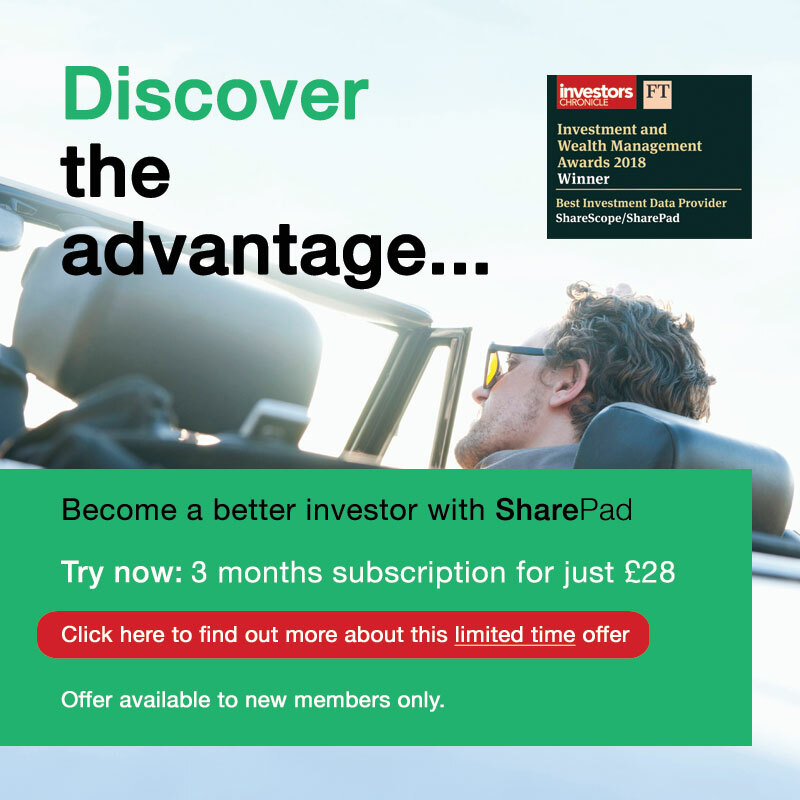 SharePad gives us the option to ignore goodwill when it calculates the Return on Capital Employed figure but not when it calculates the Cash Return on Capital Invested Figure. Goodwill is an asset created by accountants when companies acquire other companies. It represents the premium paid by the acquirer, above the value of the acquired company’s equipment, machinery, software and so on. Goodwill is a contentious issue for investors, but I treat it as an historical use of capital that has no bearing on the future profitability of all but the most acquisitive businesses. The tangible assets acquired by the company, equipment for example, will need to be replaced when they wear out, but the company will not have to buy more goodwill. 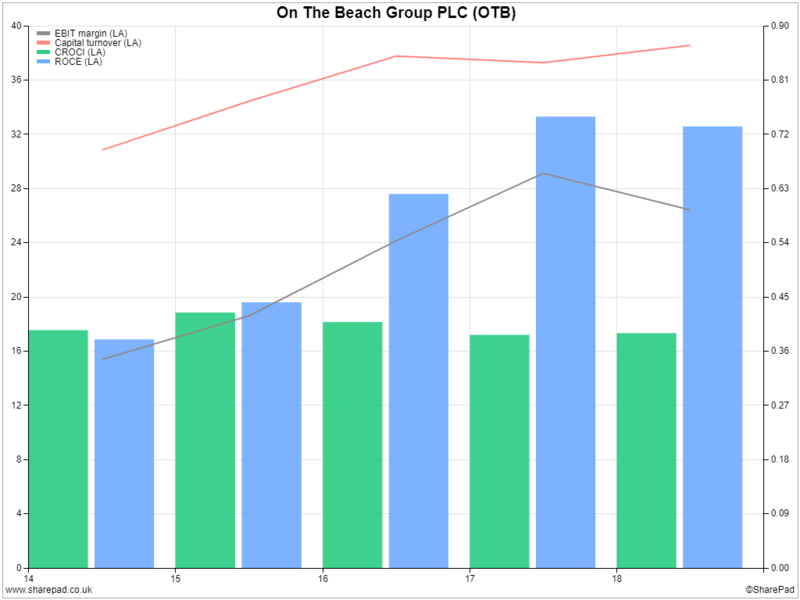 The subject is worthy of an article in itself, but one of the reasons the chart shows ROCE has grown while CROCI has not is that I have excluded goodwill from the ROCE calculation. In the last two years almost half the £40m increase in capital employed has been goodwill from two acquisitions. Deducting the goodwill means from capital employed means profit (return) is higher in comparison. Were we to calculate CROCI excluding goodwill, it too would be growing. So, on the beach has no debt, and is not just growing profit, it is growing more profitable from an already high level. In other words it is getting even better at making money. The interest rate, the rate of return on its investment, is going up. That is a good definition of a great business, if we can explain why it is so profitable. The answer may be quite simple. On The Beach is doing something that could not be done before the Internet. Through its memorably named websites, principally onthebeach.co.uk and sunshine.co.uk, customers can create their own package holidays combining flights and hotels sourced from low cost airlines and “bed banks”, wholesalers of hotel rooms. On The Beach offers customers a kaleidoscopic choice without the cost of running travel agents, planes and resorts, like traditional tour operators. Because it has been around a long time, it started out on Teletext, and it has specialised in beach holidays, the biggest holiday niche, it has become a market leader. Package tour operators have more control over the experience once their customers are on holiday, which is a good thing, but if the recent history of Thomas Cook is anything to go by, the costs may outweigh the benefits.